This is a simple but elegant way to please a crowd! I had leftover grilled tri-tip, and prawns in the freezer, which by the way are always GreaT to have on hand for a speedy meal, fresh spinach and mushrooms…AnD…here ya go! In a large frying pan melt butter over medium heat. Add prawns and garlic and sauté, stirring occasionally until prawns are cooked (they will turn pink all the way through). When cooked, place ingredients into a bowl and set aside. DO NOT WASH PAN. 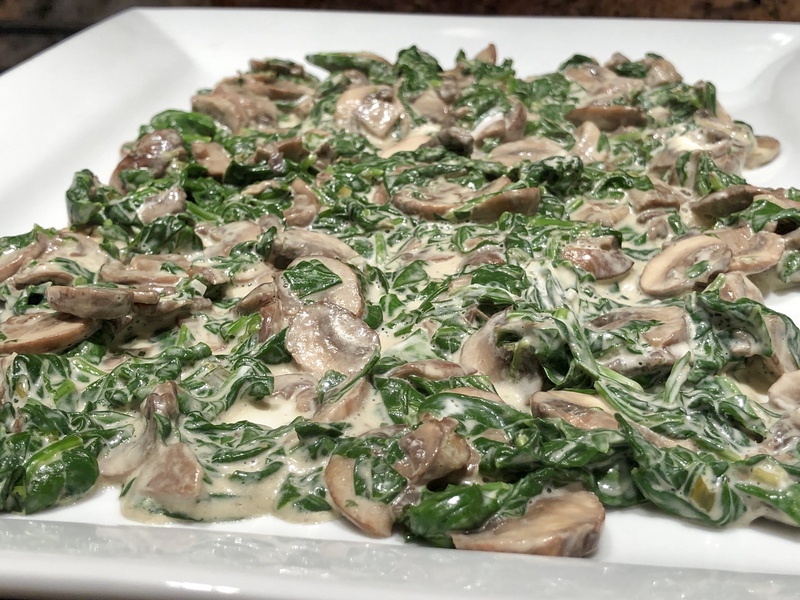 Into the same frying pan add sliced mushroom and sauté over medium heat until starting to brown; then add chopped spinach. Continue cooking until spinach has wilted and cooked for 2 minutes. Stir in cream cheese until incorporated. Remove from heat. 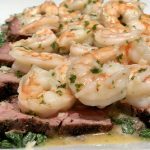 Rub tri-tip with 1 tablespoon olive oil then, season well with garlic salt, pepper and Italian seasoning. Cook over direct, medium-high heat, fat side down for 5 minutes (it will flame up, don't worry). Flip and cook indirectly, lid closed, side burners at medium heat for 20-25 minutes depending on your tri-tip size. 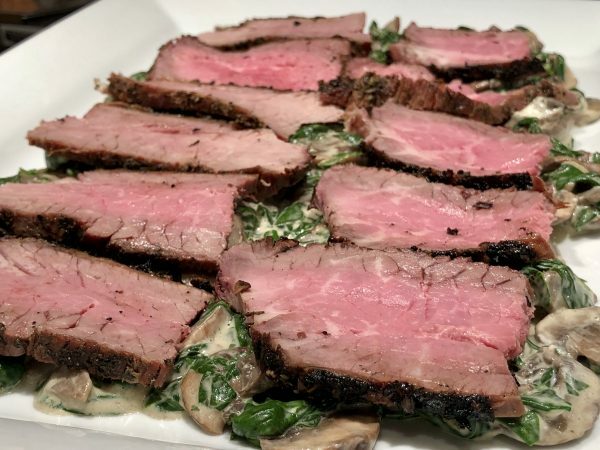 Remove from grill and cover with foil for 10 minutes before slicing. 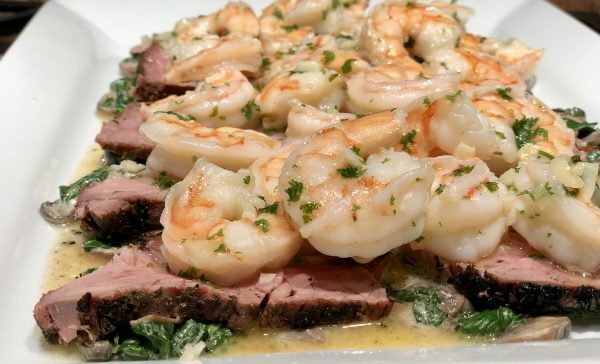 On a 9”x13” serving platter layer: creamed mushroom-spinach, sliced tri-tip, and then garlic butter prawns. 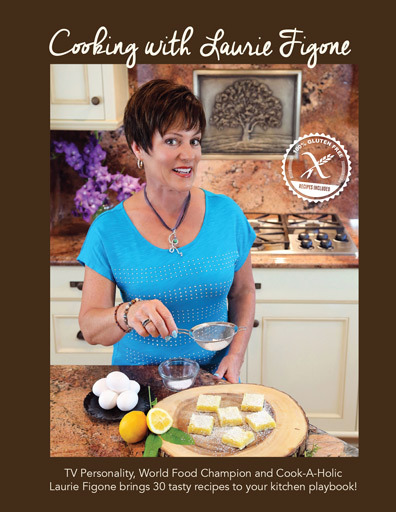 Get your copy of Laurie's new cookbook today! I'm a cook-a-holic anytime, anyplace, anything. I have had this condition for the past 44 years! Friends and family have been my enablers, always loving what I cook and always asking for more... I cannot stop myself, because I am doing what I LOVE!